There are numerous plants to consider for Atlanta and North Georgia that will bring seasonal interest to your garden. There are plants with flowers, with colorful leaves, interesting limb structure and fragrance. To begin with—-it’s hard to beat the Camellia ‘Sansanqua’, or fall blooming Camellia. The wide variety of beautiful flowers available on these shrubs is wonderful. From dark reds to light pinks, from solid white to lavenders, many different colors are available. The flower size is approximately 3″-4″ and a little looser than the Camellia ‘Japonica’ which flowers in late winter/early spring. The ‘Sansanquas’ typically flower, in the Atlanta area, in late October thru December, depending on how early the real cold freezes arrive. It’s especially nice to have flowers out of the garden for Thanksgiving and Christmas. Not many other plants flower at this time. 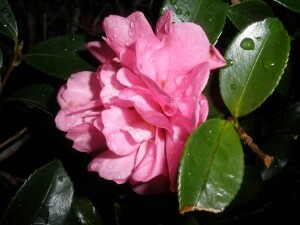 The Camellia is also a nice medium to large growing evergreen shrub with medium texture. It looks good all year. They are easy to take care of, requiring a little pruning and a little fertilizer. Most varieties will take partial shade to full sun preferring a little protection from the late afternoon sun. They are excellent when used at the corner of a house or for an evergreen screen. Some varieties to consider:—’Pink Snow’—grows fast, larger variety, profusely covered with light pink flowers; ‘Yule-Tide’—-a slower grower, smaller size, more compact, with reddish flowers and orange centers; and ‘Snow’—a pure white flower on a dark green large growing plant. There are literally hundreds of varieties to choose from. I’m sure there is one for you. You can’t go wrong with Camellias. They smell good too! Another plant to consider is the Witch-hazel ‘Diane’. This variety of Witch-hazel is spectacular. It is without a doubt one of the best plants for fall color. A 6′-8′ tall by 6′-8′ wide plant, has big leaves–6″-8″ long. This plant turns orange-red-purple all at the same time. This is a seldom seen plant, but is available and should be used more often. It is very low maintenance also. 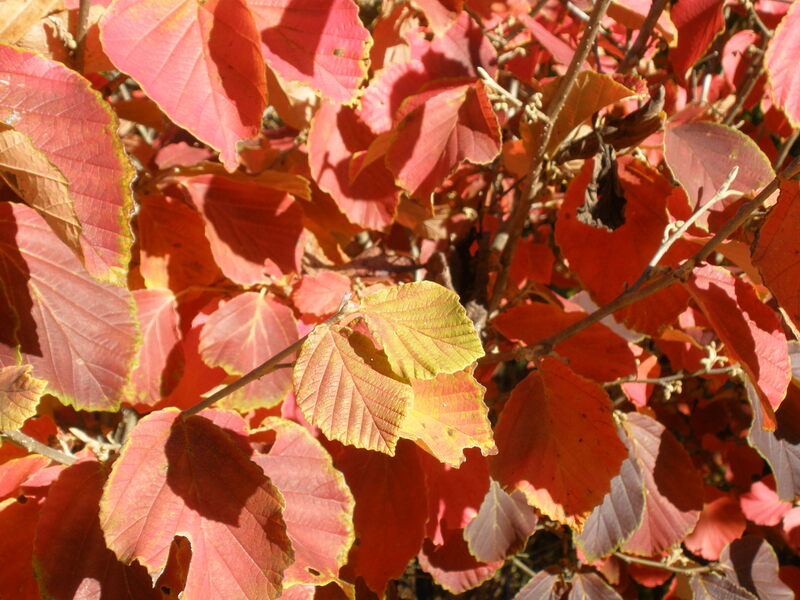 I hope these (2) plants help you select a shrub for Fall interest for your garden. If you need further assistance, we are here to help you. Call us for your FREE CONSULTATION at: 770-569-5900. This entry was posted in Georgia Garden Plant Materials. Bookmark the permalink. Plan now for Spring Landscape Installations in Atlanta. Caution Atlanta: Do Not Plant Perennials Yet! Rick Beaulieu on Fireplaces vs. Fire Pits in Atlanta Outdoor Living Areas.